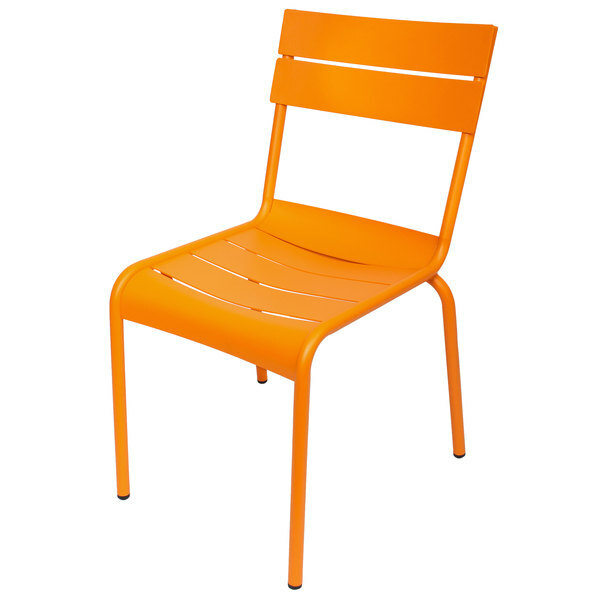 Add a splash of color to your deck or patio dining area with this BFM Seating MS802CCT Beachcomber citrus aluminum outdoor / indoor side chair! Boasting a durable aluminum construction, this chair is corrosion resistant for long-lasting use and has a citrus powder coating that won't wear out or fade as quickly as traditional paint. This is especially useful for outdoor use when the chair is exposed to bright sunlight or harsh weather conditions. It also has a slat design that helps prevent water from collecting, ensuring the chair dries fast after it rains. Not only does this chair have a curved seat for superior comfort, it also stacks with other chairs for convenient, space-saving storage. Plus, its legs are capped with plastic glides that protect floors from scuff marks and slide smoothly, helping to keep loud, unwanted noise to a minimum. Boasting an ample 250 lb. weight capacity, this strong, vibrant Beachcomber chair provides guests with a way to comfortably enjoy your signature drinks, appetizers, entrees, and desserts!